I am linking up with the amazing Holly over at Fourth Grade Flipper for her great linky "Tried it Tuesday". Be sure to check out her blog and all the great ideas being linked up this week. 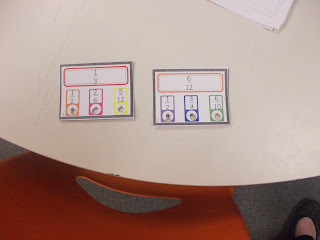 This week I want to share with you a product I tried called "iPoke Equivalent Fractions" by Elizabeth from Fun in Room 4B! This activity comes with 45 cards. At the top of each card is a fraction, underneath are 3 fractions. Students have to find the fraction that is equivalent to the top fraction. Why is it called iPoke you ask. That's the fun part. Each fraction is on an ipod and you punch holes through the middle of each ipod. 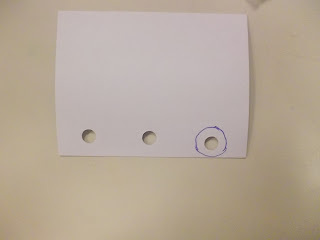 The students POKE their pencil through the hole they think is the right answer. You the fabulous teacher have put a circle on the back that shows the correct answer. 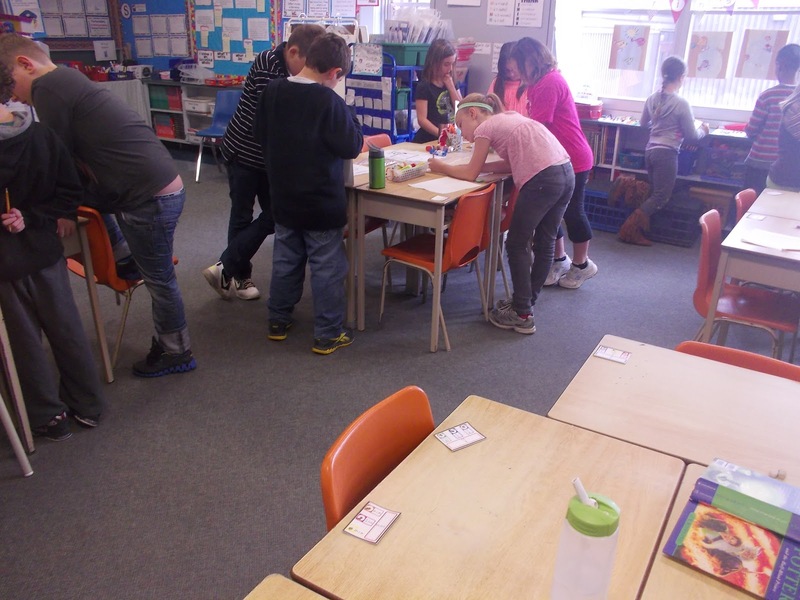 Insto-presto, students can check their work! Elizabeth includes a fabulous set of instructions with this activity and a link to a website with other Poke activities/ideas. Only I didn't really follow the instructions. Here is what I did. I printed out the cards on cardstock. Punched the holes and circled the correct answers on the back (using the handy dandy answer sheet). 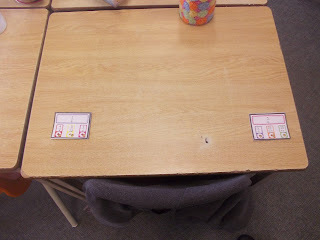 Then I placed the cards around the room. Then I gave pairs of students a recording sheet (just a quick sheet that I made with the numbers 1-45 and a space for the answer - the cards are numbered, so this worked out great) a clipboard and a pencil. I had them walk around find the cards and record answers - no poking yet!! Pairs of students hard at work. Then I had each pair collect 4 cards and bring them to the carpet. We sat in a circle and the students took turn sharing a card and their answer - then I revealed the purpose of the hole - and they checked their answers - they were super excited!! They switched cards and checked their answers and then switched again. I introduced this activity as a whole group activity because I wanted to emphasize how to use the cards - think first - then check (I have a few that would guess and then check if they knew they could). Today we went over the importance of doing the work - not just checking the answer and they really got it! I will use this activity again in a centre or with pairs or even as a whole group in two long rows. The cards have questions of varying difficulty. My class had a hard time when the top fraction was the larger fraction and they had to find a smaller equivalent fraction. I recommend this product. If you want to check it out - here is a link to it at TpT. I also recommend checking out Fun in Room 4B - I know, I know, everyone already has. I just think that if there was a Goodwill Ambassador for the teaching blogging community it would be Elizabeth. I'm always amazed when she takes the time to comment on my blog, all I can think is "I can't believe she read my post AND left a comment". I've wanted to try the ipoke activities, but haven't had a chance this year. Thanks so much for sharing how you used them. I like the idea of introducing it to them as a group without sharing how they can find the answer first. Great idea, I will need to try it out next year! That's so cute! I love self checking activities! Ipoke is great isn't it? I like the way you adapted it for whole class! Great idea!And Elizabeth is sweet isn't she? I love how you modeled having the students really "think first" before checking the answer! This has to be taught to most students because it is so tempting to have that answer key right there and check without trying. Great post! !